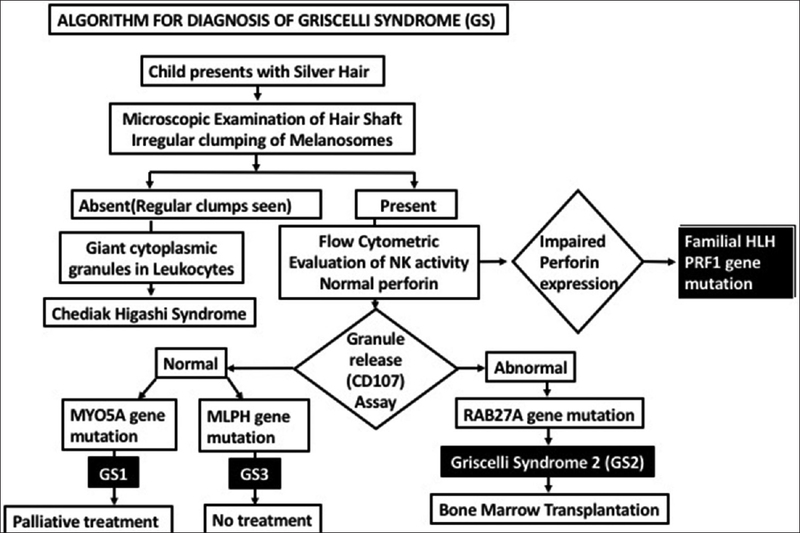 Griscelli syndrome is a rare autosomal recessive inherited disorder characterized by hypopigmentation, silver colored hair, and associated immunological deficiency, which proves fatal in the absence of timely intervention. Our patients diagnosed with Griscelli syndrome-2 presented with fever, hepatosplenomegaly, and deranged hematological and biochemical parameters. Both cases underwent detailed investigations comprising of hair mount microscopic examination, degranulation assay, and mutational studies. Our cases showed defective degranulation activity by NK cells and gene mutation analysis revealed RAB27A mutation that causes defect of cytotoxic granule exocytosis from natural killer (NK) and T-cells, manifesting clinically as hemophagocytic lymphohistiocytosis (HLH). Hematopoietic stem cell transplantation in one of the patients resulted in stable chimerism; however, the second case relapsed within a month after SCT. Stem cell transplantation is the only curative therapeutic option for GS2; thus, improvement in posttransplantation management may reduce mortality and posttransplant complications. Hence, any child who presents with partial albinism and clinical features suggestive of HLH, a peripheral blood, hair shaft mount examination along with basic immunological NK and T-cell cytotoxicity assay by flow cytometry will help clinch the diagnosis early. It can subsequently be confirmed by molecular study. Timely therapeutic intervention can prevent relapses and severe infection and improve outcome in these cases. Griscelli syndrome (GS) is a rare autosomal recessive immunodeficiency disorder, characterized by defective natural killer (NK) and T-cell cytotoxic activity that manifests clinically as hemophagocytic lymphohistiocytosis (HLH). It presents in early childhood and infancy with hypopigmentation of skin and hair, repeated episodes of infection, pancytopenia, immune dysregulation, and neurological abnormalities. Three distinct genetic forms of GS are known (GS1, GS2, and GS3) of which GS2 is the most prevalent. Mutations in RAB27A gene cause hypopigmentation of hair because of clumping of melanosomes in melanocytes and immune defect., We herein, report two cases with classical presentation of silver gray hair since birth and clinical features of HLH. Both the cases underwent detailed immunological workup in our laboratory. We observed degranulation defect in NK cells, which was confirmed by RAB27A gene mutation. Hematopoietic stem cell transplantation in one of the patients resulted in stable donor chimeric profile; however, the second one succumbed to the disease within a month after SCT. Timely diagnosis of patients with Griscelli syndrome can facilitate disease management and long-term survival. A 2-year-old female was born to a 31-year-old primigravida mother of nonconsanguineous marriage. Child had silver grey hair at birth for which parents consulted local practitioner. On day + 16 of age, the infant developed fever and was given symptomatic medication but fever continued, and she developed bluish black patches around her abdomen (ecchymosis and petechiae). The medical details were not available for this patient as she was initially treated outside our center. Thereafter, the child had similar symptoms at 1 year of age and was referred to our tertiary center for further management. On admission in our hospital, the infant had silver grey sheen of hair [Figure 1]a. Her hair mount examination showed a hypopigmented shaft with few irregular, clumps of melanosomes. Vitals were as follows: heart rate - 140/min, respiratory rate - 46/min, and temperature - 99.9F. Further systemic examination showed hepatosplenomegaly. Investigations indicated hemoglobin - 9.2 g/dL, white blood counts (WBCs) – 6,400/mm3, and platelets - 45,000/mm3. The peripheral blood examination (PBS) did not show any increase in number or size of neutrophilic granules. The serum ferritin level was markedly increased to 1800 ng/mL (normal range: 15–150 ng/mL); however, her serum triglycerides were within normal range 127 mg/dL (reference range: 0.42–295 mg/dL). The serological tests performed for any infectious etiology were all negative. A provisional diagnosis of GS-2 was considered after clinical and laboratory investigations and the patient was started immediately on treatment based on HLH protocol-2004. The patient received tab dexamethasone, cyclosporine syrup, and Etoposide injection to which she responded well and became hemodynamically stable. Meanwhile, the immunological workup was performed in our laboratory for investigation of NK cell activity. Briefly, peripheral blood mononuclear cells were stained ex vivo for surface markers with fluorescently conjugated anti-CD3 PEcy7 and anti-CD56 PE. Intracellular staining was performed with anti-perforin Fluorescein isothiocyanate. For degranulation assay, cells were stimulated with phorbol 12-myristate 13-acetate and ionomycin and incubated with anti-CD107a for 6 h at 37°C. Flow cytometric analysis was performed (BD FACS ARIAIII; Becton Dickinson, San Jose, CA, USA). The NK cell intracellular perforin expression was normal (almost 90%) [[Figure 2]a, middle panel]. However, NK cells showed no expression of CD107a (lysosomal-associated membrane protein-1) in the patient sample [[Figure 2]b, middle panel] as compared with a healthy control [[Figure 2]b, top panel]. This suggested normal pore-forming capacity but defective degranulation and cytotoxic effector function of NK cells. Furthermore, mutational analysis revealed RAB27A gene homozygous mutation (88714G > T mutation) confirming GS-2 (Centre for Medical Diagnostics, Mumbai). The patient's deranged biochemical parameters normalized posttreatment and workup for hematopoietic stem cell transplant (HSCT) was initiated. Two years back, the patient underwent a successful Cord Blood HSCT (5/6 match) in our hospital and is presently on a follow-up. The patient was administered nonmyeloablative-conditioning regimen followed by cord blood stem cell infusion. Her post-HSCT chimerism monitoring at D + 120, D + 210, and D + 365 days showed a donor profile of 99.2%. Presently, 2-year posttransplant, the child is healthy, and all her laboratory parameters have normalized. A 3-year-old male child with family history of one sibling death at 9 months from pneumonia and another stillbirth, presented in a local hospital at 17 months of age with complaints of fever and progressively increasing pallor. His vitals were as follows: temperature: 99.5 F, respiratory rate: 35/min, and heart rate: 102/min. On examination, he had silvery grey hair and mild pallor [Figure 1]b. On systemic examination, he had mild hepatosplenomegaly. Investigation of hematological parameters indicated hemoglobin: 6.0 g/dL, WBCs: 1,400/mm3, and platelets: 3.1 lac/mm3. The PBS) did not show any large granules in neutrophils. The bone marrow studies were suggestive of red cell aplasia (Parvovirus induced). The serological test for anti-IgG against Parvovirus was positive. The patient was started with Injectable ceftriaxone and Injectable amikacin to which he responded. A differential diagnosis of GS versus Chediak Higashi was considered and the patient was referred to our hospital for advanced management. On admission in our hospital, patient's biochemical profile revealed raised serum ferritin 850 ng/mL and serum triglycerides 490 mg/dL (reference range - 0.42–295 mg/dL). Hair shaft examination showed patchy melanin pigmentation. 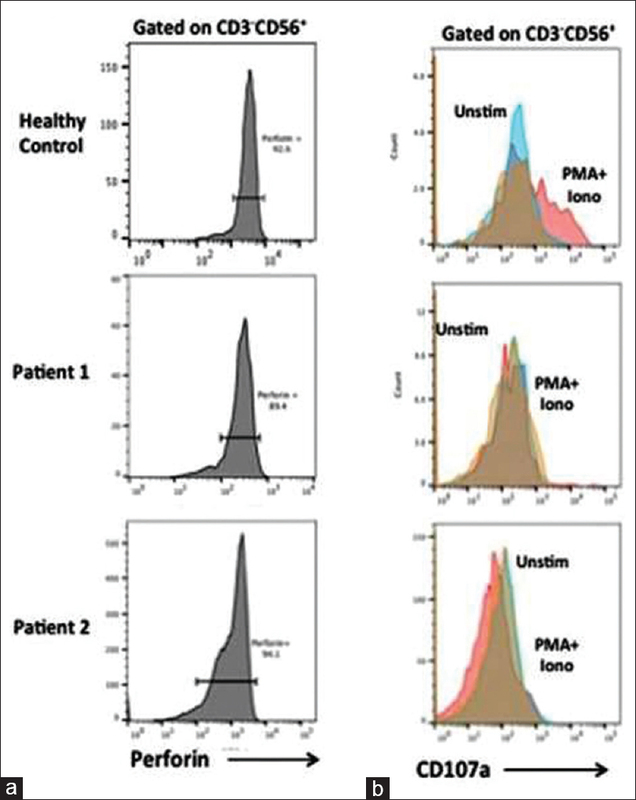 Immunological investigations to determine NK cell cytotoxic activity in the patient showed normal perforin expression [[Figure 2]a, bottom panel] but defect in degranulation marker (CD107a) [[Figure 2]b, bottom panel] as compared with a healthy control. Genomic DNA sequencing (Centre for Medical Diagnostics) showed that patient was homozygous for known pathogenic mutation c. 550C > T or p.R184X in RAB27A gene confirming the diagnosis of GS-2. Patient was planned for matched related stem cell transplant with his elder sister with whom he had a 6/6 HLA match. He was taken up for allogenic stem cell transplant. Child developed fever on+3 day and in spite of all corrective treatment protocols developed features of sepsis and finally succumbed to the disease on+11 day. The GS-2 is a rare autosomal recessive disorder, first reported by Griscelli et al. in 1978 in two French girls who presented with silver grey hair, fever, pancytopenia, and hepatosplenomegaly. It is included under the category of primary HLH syndromes and has three known subtypes categorized based on genetic and molecular features as GS1, GS2, and GS3, of which GS2 is the commonest, that is associated with immune system dysregulation. Gene mutations in MYO5A, RAB27A, and MLPH result in GS-1, GS-2, and GS3, respectively. The protein products of these three genes Myosin-Va, RAB27A, and Melanophilin form a heterotrimeric protein complex, which is involved in transport of melanosomes to adjacent keratinocytes through dendritic processes. Hence, defect in any of these three genes leads to hypopigmentation. In GS-2, mutation in RAB27A causes defect in NK and CD8 T-cells cytolytic function. Both NK cells and CTL cytotoxicity are directed against the virus or tumor laden target cells and rely on their elimination by release of lytic granules, which are specialized secretory lysosomes that contain perforin and granzymes. Rab proteins are RAS-like monomeric GTPases that are involved in protein trafficking and act as regulators of vesicular transport, docking, priming, and fusion. Oculocutaneous pigmentation with immune dysregulation besides GS-2 may also be seen in Chediak Higashi syndrome, Hermansky Pudlak syndrome type 2, Elejalde disease, and p14 deficiency that are autosomal recessive disorders having similar phenotypic expression. GS-1, also known as Elejalde disease has similar clinical features with hypopigmentation; however, definitive diagnosis rests on molecular analysis to ascertain the gene involved. Chediak Higashi has regular melanin clumps in hair shaft and characteristic giant granules in the leucocytes identified on peripheral blood examination. Hermansky Pudlak syndrome is autosomal recessive disease with oculocutaneous albinism but different clinical and immunological profile. Both our cases carried RAB27A gene mutation, thereby confirming the diagnosis of GS type 2. Our patients presented with typical phenotype of silvery grey hair since birth and history of fever, pancytopenia, and hepatosplenomegaly with hyperferritinemia. These signs should raise suspicion among clinicians and deeper investigations for diagnosis of GS should be carried out for early intervention. We propose a diagnostic algorithm for infants born with silver grey hair who manifest clinically as HLH and include additional laboratory workup [Figure 3]. Surface expression of CD107a on NK cells and CTLs is used to measure the integrity of granule-mediated cytotoxicity pathway, which was found to be defective in both our patients. Normal expression of intracellular perforin was observed as evaluated by flow cytometric analysis of NK cells (CD3- CD56dim population). However, the degranulation assay performed on both CD8+ and NK cells showed markedly reduced surface expression of lysosome-associated membrane glycoprotein-1 (CD107a). One of our patients underwent a successful 5/6 matched unrelated Cord Blood transplant 2 years ago and is doing well presently with donor type profile suggesting complete engraftment. Our second case, postallogenic HSCT, manifested as graft failure with lack of engraftment, developed sepsis, and died as a consequence of the disease. Awareness among clinicians of this entity can avert devastating complications. Rarity of this syndrome, variable clinical presentation, lack of specialized flow cytometry, and genetic laboratories often delays the diagnosis. Though HSCT offers a promising treatment modality for this rare inherited immune syndrome, the final outcome varies. Also, families with known HLH mutations should be counselled and educated regarding the importance of prenatal testing if future siblings are being planned. Meschede IP, Santos TO, Izidoro-Toledo TC, Gurgel-Gianetti J, Espreafico EM. Griscelli syndrome-type 2 in twin siblings: Case report and update on RAB27A human mutations and gene structure. Braz J Med Biol Res 2008;41:839-48. Pastural E, Barrat FJ, Dufourcq-Lagelouse R, Certain S, Sanal O, Jabado N, et al. Griscelli disease maps to chromosome 15q21 and is associated with mutations in the myosin-Va gene. Nat Genet 1997;16:289-92. Ménasché G, Pastural E, Feldmann J, Certain S, Ersoy F, Dupuis S, et al. Mutations in RAB27A cause Griscelli syndrome associated with haemophagocytic syndrome. Nat Genet 2000;25:173-6. Singh A, Garg A, Kapoor S, Khurana N, Entesarian M, Tesi B. 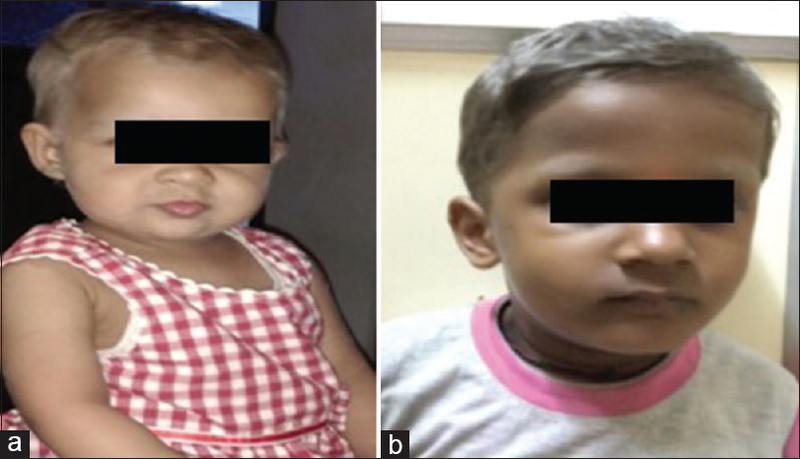 An Indian boy with Griscelli syndrome type 2: Case report and review of literature. Indian J Dermatol 2014:394-7. Bahadoran P, Aberdam E, Mantoux F, Busca R, Bille K, Yalman N, et al. Rab27a: A key to melanosome transport in human melanocytes. J Cell Biol 2001;152:843-50. Dustin ML, Long EO. Cytotoxic immunological synapses. Immunol Rev 2010;235:24-34. Zerial, M, and McBride, H. Rab proteins as membrane organizers. Nature Rev Mol Cell Biol 2001;2:107-17. Alsuheel AM, Shati AA, Alshehri AA, Otaif MY. A novel RAB-27A mutation causing Griscelli syndrome type 2 with severe central nervous system involvement: Case report and review of literature. Int J Med Med Sci 2013;5:467-70. Bryceson YT, Pende D, Maul-Pavicic A, Gilmour KC, Ufheil H, Vraetz T, et al. A prospective evaluation of degranulation assays in the rapid diagnosis of familial hemophagocytic syndromes. Blood 2012;119:2754-63. Ramos-Casals M, Brito-Zerón P, López-Guillermo A, Khamashta MA, Bosch X. Adult haemophagocytic syndrome. Lancet 2014;383:1503-16. Schmid P, Moshous D, Boddaert N, Neven B, Cortivo LD, Tardieu M, et al. Hematopoietic stem cell transplantation in Griscelli syndrome type 2: A single-center report on 10 patients. Blood 2009;114:211-8. Cesaro S, Locatelli F, Lanino E, Porta F, Di Maio L, Messina C, et al. Hematopoietic stem cell transplantation for hemophagocytic lymphohistiocytosis: A retrospective analysis of data from the Italian Association of Pediatric Hematology Oncology (AIEOP). Haematologica 2008;93:1694-701.